My wife and I always wanted to try out smoking a Brisket or ribs ourselves partly to blame are those food channels that feature mouthwatering smoked meats, yummy right? We haven’t tried any of the new restaurant that offers smoked meat nor the famous smoker that has a stall in Centris Sunday Market. But we’ve always wanted to experiment on smoking meats ourselves. I guess great food are discovered by people who love to eat and that are daring enough to experiment. I know we would fail at first but hey, as long as we are having fun I know that in the end we will succeed. Enough about the that let’s talk about the smoker. 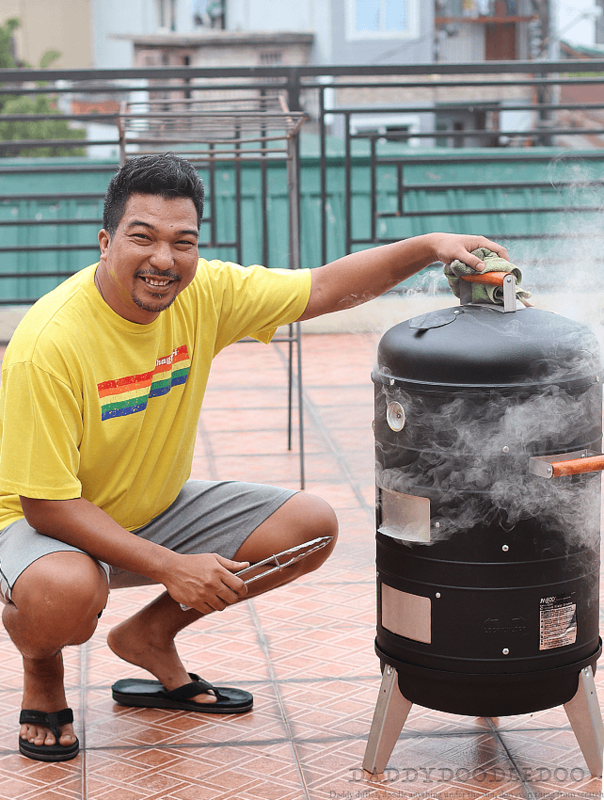 We bought a Meco Charcoal Water Smoker And Grill from Landers Superstore a few weeks ago. We needed to replace our old grill so the timing was perfect and besides the smoker was on sale. This Meco Charcoal Water Smoker and Grill is my first smoker. It has 3 steel legs that provide stability, a structure that’s design to handle high levels of heat, maximize, and keep it inside. The outside is covered with a black powdered coat that helps it against the elements, I guess. There is a built in temperature indicator but is it doesn’t tell you the exact temperature. I guess it’s just there to serve as a guide. So I should still buy one of those BBQ/grill wireless temperature probe to find out the exact temperature inside of the smoker. Inside, there are two cooking grills that’s on top of each other. Then there is a porcelain pan that you put water into when your smoking that helps the meat to preserve its juice inside. Now let’s talk about the feature of this smoker, there is a double sliding door that allows you access to your pan to add water or to the wood chips to add your wood chips, of course. I live in the Philippines and wood chips for smoking is not readily available at the local market. To find them I first did some research (that means I googled it, LOL). I found out that all that you need for smoking are available in True Value or Wilcon. True Value has different kinds of wood chips to choose from like cherry, cedar, apple, hickory, and mesquite. They also carry different charcoals that you can choose from. Plus numerous accessories for your smoking needs. Now in Wilcon, you have limited options to choose from. At the time I went there they only have hickory wood chips and one type of charcoal but they sell it for a cheaper price compared with True Value. For our first try, we bought pork ribs from the supermarket. My wife was the one in charged for the Rub that will bring flavor to our meat while I preheat the smoker. The charcoal we bought was smokeless and this is the first time I am using this. With local charcoal that I was using before for BBQ I usually start it up using a fuel gel but for the smokeless charcoal the fuel gel did not work. So next time I am planning to buy a BBQ chimney charcoal starter. I was able preheat the smoker and the outside temperature indicator read warm. 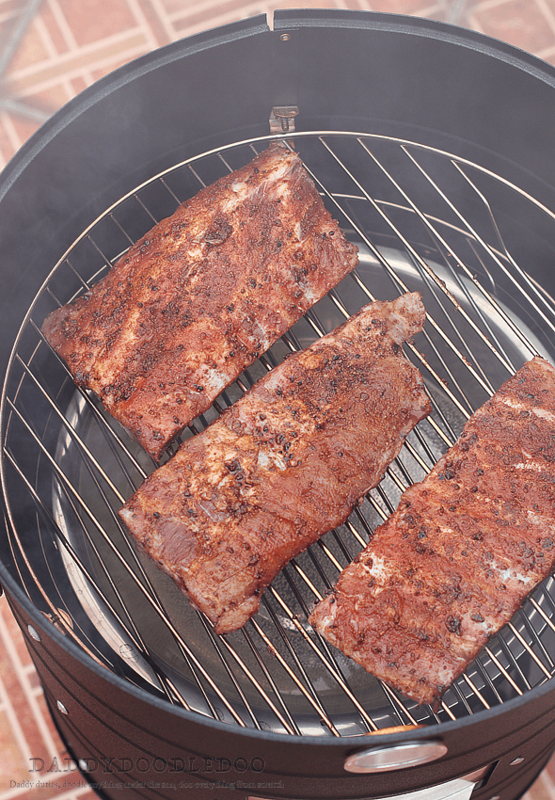 The next thing we did was fill the pan with water then laid our pork ribs side by side, we used both grill racks. We decided to use hickory for our pork ribs but I didn’t have any idea how much to put plus what we have were large chunks of hickory. I decided to experiment in putting 1 chunk of wood every 30 minutes. We decided to leave our ribs in the smoker for 2 1/2 hours. After 2 1/2 hours on the smoker we opened the top of the smoker and removed our ribs and spread some BBQ sauce all over the meat. Then we returned them on the grill for another 15 minutes to let the sauce get inside the meat. The result was a very smoky but still juicy pork ribs that we shared with our family together with my sister in law and cousin. The best part was we enjoyed every step of the smoking process and specially the eating part. That looks amazing! I wanted that kind of grill too, how much did you get it? Hi, thanks for reading. We bought it in Lander’s on a sale price of 3,200 pesos. But I don’t think they carry that brand anymore. Oh my, I’m so envious. 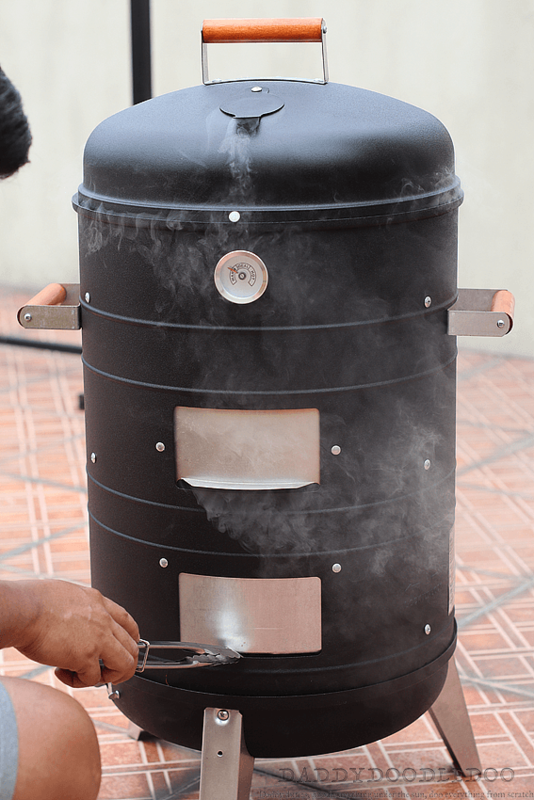 I’ve been wanting a smoker but I live alone and wasn’t sure how hard it would be for me to use. You’re making me hungry, lol. I’m highly jealous! Smoked Ribs and burgers are the absolute best. Once you’ve had them smoked, you’ll never want them any other way. If I didn’t live in this apartment, I’d get me a smoker. My husband has been talking about getting a smoker, we use to have one but wore it out. Will have to show him this one and see what he thinks. We love to smoke all kinds of different foods. 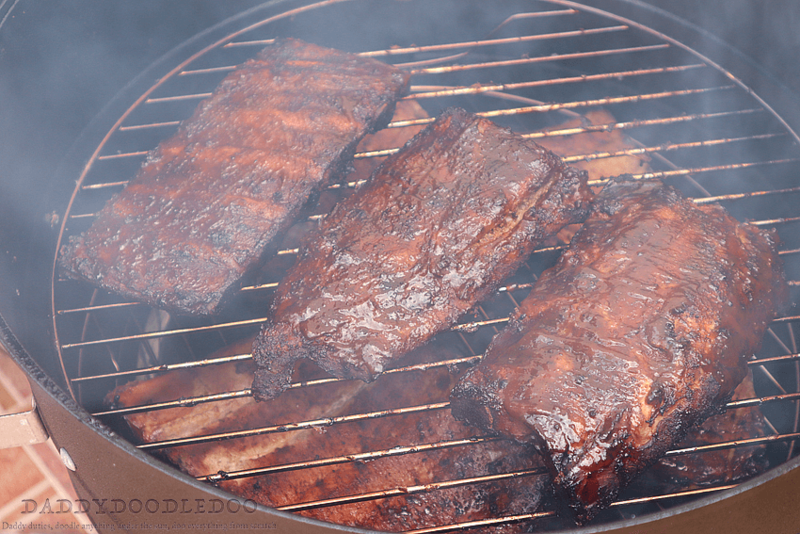 Oh baby, those ribs look so good! I’ve always wanted a smoker, but it’s always been one of those “maybe someday” things. But if I win the lottery it’ll definitely be one of the first things I get! Oh wow I have wanted one like this for ages now! We eat outside a LOT in the summer, it looks perfect for entertaining too! I love smoked food, especially burgers! My husband uses his Big Green Egg every weekend. I’m not sure if he knows about the water method! Definitely going to share that with him. Thanks for reading and hopefully your husband and I can swap recipes. That is absolutely great and it looks so delicious like other famous restaurant our there . Thanks for reading. I’m going to keep practicing until I get better.